Come and view our four private hire options over a cocktail! Looking for a Central London venue for your event? Whether you are celebrating a birthday, wedding, special occasion or hosting an office party, Eaton Square Bar & Restaurant is the perfect choice. With 3 VIP rooms plus the option to hire the whole venue, we can accommodate parties from 8 - 200 guests standing for cocktails, finger food or canapés, or 2 - 125 guests seated for dinner. Come and meet Michal, our Events Manager, and view our beautiful venue and VIP booths and rooms while you enjoy one of our signature cocktails – or simply call or email to let us know your requirements and we will work with you to create a truly memorable event. Drinks Party – up to 200 guests. Seated Dinner – up to 120 guests. Holds 3 round tables of 5/6 guests seating, and with a capacity of 20 guests. 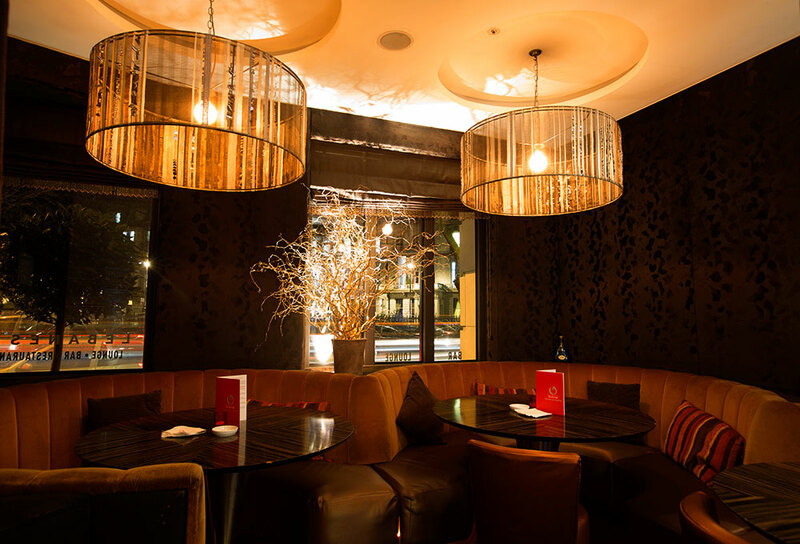 The decor is very unique compared to the rest of the Eaton Square Bar with cowhide and leather seating that gives a feeling of warmth and intimacy. A heavy curtain can separate the Cognac Room to the main lounge. Drinks Party – up to 20 guests. Seated Dinner – up to 15 guests. The Champagne Room is a semi-private room opened to the main bar and lounge which can also be booked for parties of up to 12 guests seating or 15/20 guests for a drinks reception. Drinks Party – up to 15/20 guests. Seated Dinner – up to 12 guests. The Crystal room's capacity is 28 guests seating or 45 guests for a stand up reception. Sliding doors offer a complete privacy from the restaurant, the room can be themed, branded according to the event and occasionally can be used as a dance floor. Drinks Party – up to 45 guests. Seated Dinner – up to 28 guests.